Global smart eyewear technology market expected to reach USD 63,650.million by 2025 with the expected CAGR of more than 39% between the years 2017 and 2025. The report covers forecast and analysis for the smart eyewear technology market on a global and regional level. Market opportunities are discussed in detail. The smart eyewear technology market has been analyzed using Porter’s Five Forces Analysis. The market is segmented on the basis of technology, product type, distribution channel, operating system and application, which in turn bifurcated on a regional level as well. The report deals with the in-depth quantitative and qualitative analyses of the smart eyewear technology market. Smart eyewear technology is a wearable device that adds information in glasses. Smart eyewear can collect information from internal or external sensors.Smart eyewear is a wireless technology that includes Bluetooth, Wi-Fi, and GPS. This can also be operate via mobile and function as portable media players to send audio and video files to the user. 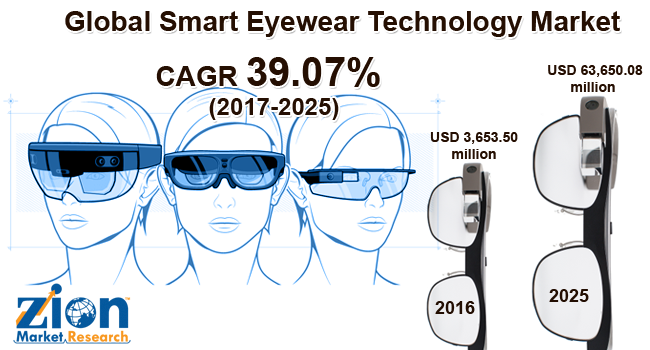 The global smart eyewear technology market was valued at USD 3,6530.0millionin the year 2016 and expected to reach USD 63,650.0million by 2025 with the expected CAGR of more than 39% between the years 2017 and 2025. The major factor driving the growth of the market is increasing adoption of virtual reality technologies. Rising demand for smart devices enabled with AR and VR technologies are expected to propel the growth of the market in the future. According to research, AR and VR devices are expected to be valued at around USD 95 billion by 2025. As per data over 20 million U.S. consumers are willing to wear augmented reality devices. Considering these factors smart eyewear technology market is expected to reach around USD 63,650.Million. Increasing investment by a major player such as Google, Microsoft and Facebook into the market will boost the revenue of smart eyewear technology market. The increase in start-ups across the globe would help in the dynamic growth of the smart eyewear technology market. Additionally, Facebook has invested USD 2 billion in the acquisition of virtual reality gear maker Oculus in 2014. These factors will contribute the growth of smart eyewear technology market. However, Smart eyewear technology market is expected to face some challenges such as high initial investment and limited battery life. Increasing demand for lightweight head-mounted displays and portable devices are expected to offer growth opportunities for the market. Mixed reality segment is expected to register the highest CAGRof over 43% over the forecasted period. This can be attributed to mixed reality technology that can provide enterprise employees with the best physical and digital worlds. Mixed reality includes various features such as mapping physical surroundings, language processing for voice recognition, monitoring gestures and others. Such features will propel the growth of mixed reality segment in the years to come. Head-mounted displays (HMDs) segment accounted for the largest market share of around 60% in 2016. This is mainly driven by technological advancements like 3D viewing, development of high-resolution HMDs, and integration of AR and VR technologies that will lead to the increasing demand for head-mounted displays segment. The growth of this market can be attributed to the availability of low-cost headsets such as Google Daydream View and Samsung Gear VR is raising the demand for head-mounted displays segment. The increasing number of small and medium players in the market with offerings of headsets at low cost is one of the key reasons behind the wide adoption of head-mounted display headset. Online stores segment expected to project high CAGR of 40% in 2017-2025. Global e-retail sales were USD 1.9 trillion in 2016 and expected to reach up to USD 4.06 trillion by 2020.Looking into this online stores segment is expected to post rapid growth in near future. The market for the Android segment is expected to grow at the highest CAGR of 40% between 2017 and 2022. Growing adoption of Android to the built custom application of wearable devices for increasing revenue attains tremendous business growth. Android has many features such as it is an open source operating system, the middleware framework for smart devices, a low investment with high ROI, multiple language supporters and user-friendly. These factors are fueling the growth of this segment. Consumer electronics segment acquired the largest market share and valued at USD 1,770 Million in 2016 and anticipated to dominate the market during the forecast period. The increasing demand for smart gadgets and gaming devices is driving the growth of the smart eyewear technology market for the consumer electronics vertical. North America held the largest share of the smart eyewear technology market between 2017 and 2025. The presence of global leading players in the U.S. and the growing demand for consumer electronics products will boost the growth of the market in North America region. In addition, growing investments by key players and innovations in technologies such as augmented and mixed reality are driving the growth of the smart eyewear technology market across the globe. The report includes detailed profiles of the prominent market players that are trending in the market. The lists of the players that are compiled in the report areGoogle Inc, Sony Corporation, Microsoft Corporation, Epson America, Inc, Lumus Ltd, Vuzix Corporation, Meta Company, Optinvent SA, Osterhout Design Group, Kopin Corporation, Lenovo, Recon Instruments, Samsung Electronics Co., Ltd. The prominent market players maintain the competitive edge in the global market by making investments in the mergers and acquisitions and by increasing their product portfolio.In September 2017, BAE Systems launched augmented reality glasses for military and commercial customers.